We were inspired originally by bands such as the Doors, Cream, the Moody Blues, the Beatles, and Procol Harum. We were later heavily influenced by ELP, Yes, King Crimson, and Genesis. Echoes of these styles are found in the Distant Shores recordings. 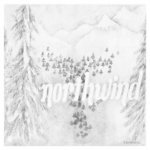 In 1974 Tom, Jan and Roland recorded the world famous (in collectors' circles) Northwind demo album in Roland's family's basement. This album is often erroneously referred to as “Woods of Zandor.” Tom was at heart a jazz drummer, and when he left Northwind, Tim Cahill joined on drums and percussion. For a short period, Bob Pascoe contributed his rock guitar to Northwind's sound. Northwind performed mostly in clubs at that time and created a reputation in Canada. This period largely had the band playing covers of other rock bands' material. In 1977 returning to original music, Roland took over guitars and the band added the talents of Rob Foster on wind instruments. In 1978 we recorded our magnum opus “Distant Shores” in Roland's family's basement in Sterling Heights, Michigan. Tim Cahill's religious calling conflicted with his perception of the rock and roll lifestyle leading him to leave secular musical performing. Howard Wells joined the band on drums and percussion for rehearsals while Roland and the band's manager Ron Geddish vainly persued a record contract. These efforts included a trip to California to visit record companies. Northwind broke up in 1978 largely because of this failure. In the end, the “Distant Shores” songs were never performed outside of Roland's basement.